Historian Yu Ying-shih (left) and Tang Prize Foundation CEO Chern Jenn-chuan. New York, Aug. 15 (CNA) Chinese-American historian Yu Ying-shih, the first Tang Prize winner in Sinology, promised Friday to visit Taiwan for the first time in six years in September and attend the Tang Prize award ceremony and related events in person. 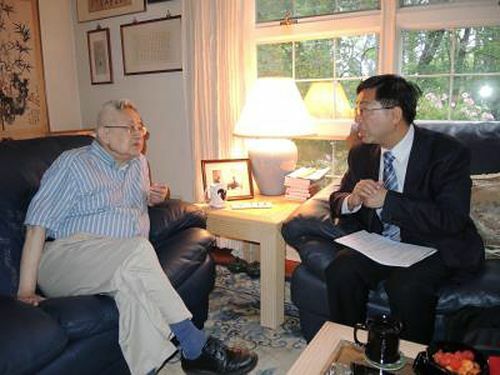 Yu, a Princeton University emeritus professor, is regarded by many of his peers as the greatest Chinese intellectual historian of his generation. The 84-year-old felt "surprised and overwhelmed" when he first learned of winning the prize and said he was honored by the visit of Tang Prize Foundation CEO Chern Jenn-chuan. Chern is making courtesy calls to all Tang Prize winners to invite them to Taiwan and have them accept their awards in person. Before visiting Yu, Chern went to Norway to see Gro Harlem Brundtland, the Tang Prize's first sustainable development laureate, who also agreed to attend the one-week extravaganza in Taiwan. The China-born Yu said he plans to arrive in Taipei on Sept. 13 and will attend the award ceremony on Sept. 18, deliver a speech the following day, and then participate in a forum on Sept. 20. Over the past 60 years, Yu has published around 60 books and hundreds of essays in English and Chinese. In 1976, he published the essay collection "Li Shi Yu Si Xiang" ("History and Thought") in Taiwan, which went on to become one of his most influential works. In addition to his scholarly pursuits, Yu is an outspoken supporter of the democracy movement in China and is known to have sheltered young refugees who fled China after the Tiananmen Square massacre in 1989. In 2006, Yu won the U.S. Library of Congress' John W. Kluge Prize for lifetime achievement in the study of humanity. The Tang Prize was established in 2012 by Taiwanese entrepreneur Samuel Yin to honor leaders in four fields: sustainable development, biopharmaceutical science, sinology and rule of law. Laureates are selected based on the originality and impact of their achievements, irrespective of nationality or ethnicity. All five winners of the four prizes are expected to be in Taiwan for the awards ceremony next month.